The bedroom furniture in the guest room today is such a very good replication of what was actually in the room on the day of the murders that guests to the house think it is the actual furniture. 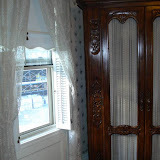 Abby’s head is seen in the old sepia photographs lining up at the middle knob on the dresser as she lay on the floor between the dresser and the bed. There was a small folding canvas camp chair in front of her head and the sewing machine was in the northwest corner where the large armoire is today. The green dress in the corner was worn by Elizabeth Montgomery in the 1975 film The Legend of Lizzie Borden and was designed by Guy Verhille for the Paramount Studios production. The house on Second Street has many visitors over the year, both day tourists and overnight guests at the B&B and all without exception gravitate to the black sofa, a close copy of the original upon which Andrew J. Borden breathed his last. So many have sat for photos on this piece of furniture that the original one put in the sitting room in 1996 has been reupholstered twice and has retired to the gift shop while a second black sofa had to be purchased for the sitting room. 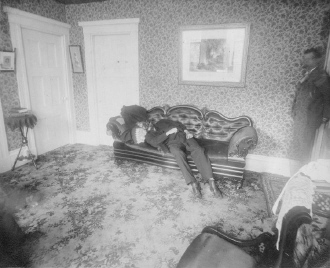 The sitting room, crime scene of the second August 4, 1892 murder is little changed today from what it was 116 years ago. The windows are original, the doors and moldings, mop boards and fireplace are just the same. There were 2 chairs, a sofa, a tripod table and a small center table in the room. 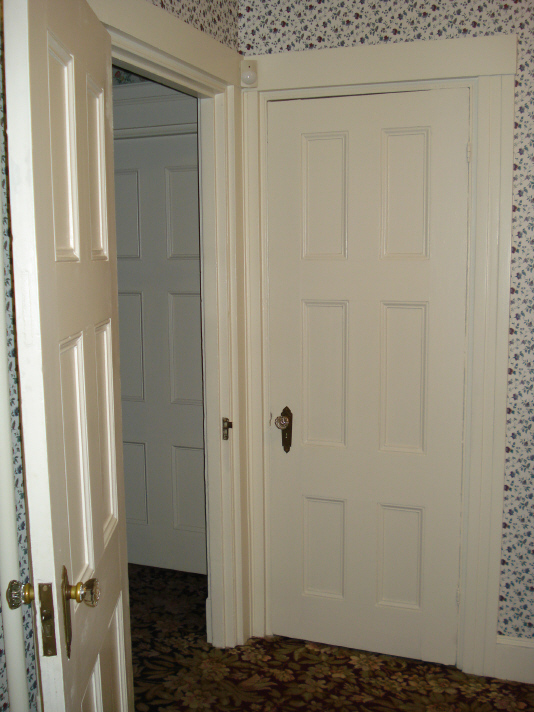 The closet under the staircase was used for hats and old coats and jackets. It is a deep closet, with the original hooks intact today. Considering the blood spatter pattern, the general consensus was that the killer most likely stood near the diningroom doorway near the head of the sofa to administer the blows to the dozing head of Andrew Borden. The photo montage below is a 360 degree view of the room beginning north, clockwise around the room. This is the first of a new series featuring 360 degrees of still photography of each space within the Borden house on Second Street as it appears today. The entry and kitchen were scenes of much action on August 4th. The side (North) entry door would appear to have been the only way a killer could have sneaked in unaided, during the time the maid was out washing windows and Lizzie was in the barn. The bottom of the back stairs was the spot where Lizzie told her neighbor Mrs. Churchill, first on the scene, all about what had happened. Lizzie was seen leaning against the screen on the inside. Later pharmacist Mr. Bence would peer down this same back entry hall and identify Lizzie as the woman who had tried to buy Prussic acid on the day prior to the murders. Many neighbors, friends and police would pace up and down the short length of back hallway that day, coming in and out of the house. Emma, returning from Fairhaven would walk into this space after she got off the train, finding shocking things going on in the sitting room and diningroom. The day after the funeral, Lizzie would be observed burning up a skirt and blouse in the kitchen stove by her friend Alice Russell. If walls could talk, the entry and kitchen would have plenty to say!